The decision to hold the 1956 Olympics in Melbourne – the first outside the northern hemisphere – was taken in April 1949. Melbourne won over Buenos Aires even though the equestrian events would have to be held in Stockholm because of Australia’s strict horse quarantine regimes. The horses and their riders were well out of it, because large areas of grazing land – the food supplies of major cities such as Melbourne – were ‘top-dressed’ by radiation fallout from the six atomic bombs detonated by Britain in Australia during the six months prior to the November 1956 opening of the Games. This article looks at the sixty years of cover-up that followed in both the scientific and political discourses that included a Royal Commission into British Nuclear Tests in Australia in 1985. Prime Minister Robert Menzies agreed to the use of Australia as Britain’s atomic testing ground within hours of returning to office in December 1949, without consulting his Cabinet. As we will see in another article, Prime Minister Chifley had been very keen to involve Australia in Britain’s post-war ‘Empire Defence’ project, and indeed for Australia to acquire tactical nuclear weapons for its own regional defence. And we shall see that the weapons development carried out in Australia moved from atomic to nuclear just months before the 1956 Olympics, in the development of the British thermonuclear H bomb that was detonated off Malden Island in May 1957. The 1956 detonations at the Monte Bellos and Maralinga could be something approaching an H-bomb. It is significant that while this Australian official history referred to Atomic tests, the title 1985 Royal Commission report referred to British nuclear tests. The negotiations with the British for the use of the Monte Bello islands less than 50 miles off the coast of West Australia, then Emu Field, Woomera and Maralinga in the outback of South Australia – five hundred miles from Adelaide and less than a thousand miles from Melbourne as the crow flies (or the wind blows) – ran parallel with the preparations for the Games through the first half of the 1950s. I have found only two references to the November 1956 Olympic Games in twenty five years of researching the British tests in Australia’s backyard. How were the Games elided from the scientific and public debate about atomic weapons testing in Australia in 1956 – and for the next sixty years? A year later the testing had moved on to the Australian mainland, to Emu Field in South Australia. In October 1953 in Operation Totem, two bombs were detonated on 31 metre towers – less than a third the height of the steeple of St Paul’s Cathedral in Melbourne. The 1985 Royal Commission into the British atomic tests in Australia noted that “There is a suggestion in a document of 25 January 1954 that the Australian Government would not want any publicity about a permanent proving ground until after the forthcoming Federal election (29 May 1954). There is no discussion of the propriety of such a decision being taken shortly before an election.” There was also no discussion in the 1985 Royal Commission report of the impending Olympics as this decision was made. On the day of the first of the six 1956 tests, back at Monte Bello – six months before the opening of the Olympics in Melbourne – Ernest Titterton, an English physicist who had recently been appointed to a chair in nuclear physics at the Australian National University after working on the Manhattan Project and at Aldermarston, explained why the atomic devices were being tested in Australia. “Because of the hazards from the radioactivity which follows atomic weapons explosions the tests are best carried out in isolated regions – usually a desert area… Most of the radioactivity produced in the explosion is carried up in the mushroom cloud and drifts downward under atmospheric airstreams. But particular material in this cloud slowly settles to the ground and may render an area dangerously radioactive out to distances ranging between 50 and several hundred miles [emphasis added]… It would therefore be hazardous to explode even the smallest weapons in the UK, and it was natural for the mother country to seek test sites elsewhere in the Commonwealth.” He made no mention of the imminent Olympic Games. The Atomic Weapons Tests Safety Committee was established for the 1956 tests. Its purpose, according to the 1985 Royal Commission into the Australian tests, was “to examine information and other data supplied by the United Kingdom Government relating to atomic weapons tests from time to time to be carried out in Australia for the purpose of determining whether the safety measures proposed to be taken in relation to such tests are adequate for the prevention of injury to persons or damage to livestock and other property as a result of such tests”. Essentially the AWTSC’s task was meteorological – the Royal Commission accepted that “meteorological tasks were an Australian responsibility” at Operation Buffalo, the four tests conducted in September and October 1956. As an afterthought the Director of the Australian Bureau of Meteorology was co-opted on to the AWTSC. But there were no biologists on the AWTSC who could have advised about intake of radioactive particles by humans or animals. The AWTSC members were never privy to technical information about the composition of the bombs but were only permitted to know the estimated yield in order to decide whether it was ‘safe’ to detonate them – that is to say, whether the weather conditions would carry the expected radioactivity away from the major cities and towns which were mainly to the east and south east of the ground zeros at Monte Bello and Maralinga. It was accepted by the AWTSC that there would be dangerous contamination of the immediate area around the blasts, and the ‘intermediate zone’ up to four hundred miles radius from ground zero which was held to be sparsely populated, mostly by Aboriginal people. The present discussion is focussed on the ‘long range’ contamination beyond the intermediate zone because Melbourne was the venue for the Olympics in November 1956. The first two 1956 detonations took place in May and June at the Monte Bello Islands. The first had a yield estimated at 15 kilotons. 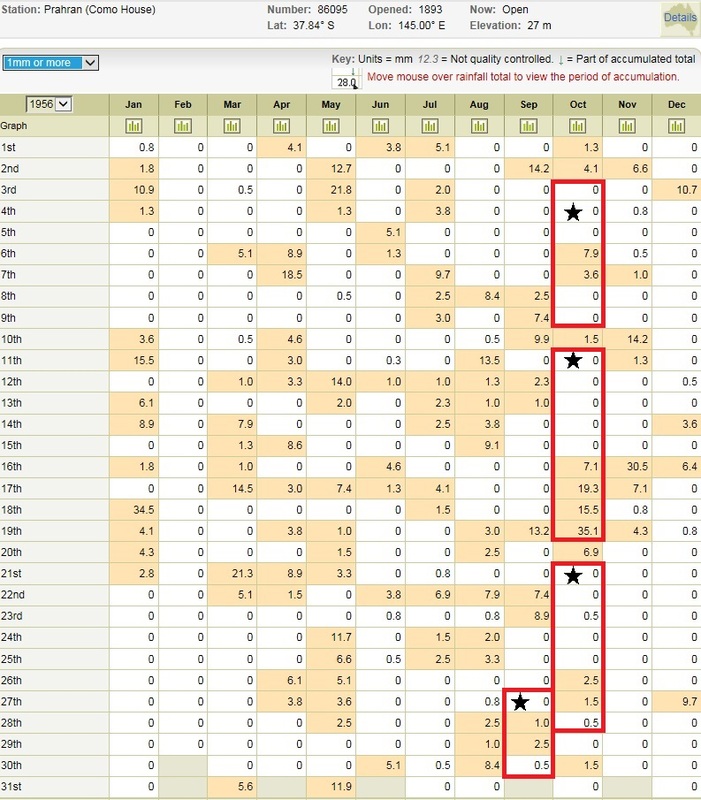 The second was an unexpected 60 kilotons – more than the four earlier yields combined. Mr Patrick Sheehan, Head of the Mining and Metallurgy Department at the Ballarat School of Mines, was not so sure. He was reported in the Melbourne Argus of 28 August 1956 as saying “Keep your overcoats on and get your umbrellas ready. And get your geiger (sic) counters out too. We are going to get THE BIG RAIN within three to five days after the atomic explosions at Maralinga, South Australia, early next month.” Mr Sheehan was worried about “what our own weather will be after Maralinga in September when the bombs will explode. THEY’LL EXPLODE JUST TWO MONTHS BEFORE THE OLYMPIC GAMES. [emphasis in original].” This is the first of the two references to the conjunction of the atomic bomb tests and the Olympic Games I have found. The Olympic Games would open a thousand miles to the east in three months, November 22, 1956. These two press reports indicate that even Australian scientists outside those working at the Los Alamos of the British Commonwealth knew about the vagaries of wind-borne fallout patterns and the role of rain in helping radioactive particles to settle on the ground – and the possible long term effects of ingesting and inhaling the radioactive isotope, Strontium 90. The AWTSC sought guidance from the Government about acceptable levels of contamination for the 4 Buffalo firings in September and October 1956 since “It is manifestly impossible to prevent radioactivity from falling on the mainland in the case of the Maralinga tests.” It was also concerned about fallout from rain ‘at great distances.’ The Safety Committee seems to have made no mention – on paper at least – of the approaching Olympic Games. The Royal Commission report states “an examination of the Safety Committee report to Cabinet and the Minute recording Cabinet’s decision indicates that the Australian Government was appraised in considerable detail of the Buffalo program and the possible safety ramifications away from the Range.” It notes that “The Cabinet decision was taken in an atmosphere of public opposition to the test program in Australia” but does not mention the imminence of the Olympic Games. Thirty years later, the Royal Commission concluded that Buffalo Round I, the first detonation at Maralinga, less than two months before the opening of the Olympics, “was fired at a time when the fallout was predicted to violate the firing conditions that had been proposed by the Safety Committee and agreed to by the Government.” The firing was repeatedly delayed, to the extent that concern was expressed in press and Parliament “that the delay was evidence of the great danger that the tests posed” – but no mention was made of the approaching Olympics. The official history says “Penney signalled… Main worry Safety Committee thunderstorms Adelaide to Melbourne. This was political and not safety… Real culprit is completely exceptional weather. Conditions vary widely every few hours and Australian meteorological grid cannot cope with fine structure…Am studying arrangements firings but not easy. Have Olympic Games in mind but still believe weather will not continue bad…We can never guarantee that activity will not be found in rain 500 or more miles away.” [emphasis added] This is the only reference to the Olympic Games I have found in the official archival documents I have read over the past twenty five years about the British atomic tests in Australia. The official historian made no comment thirty years later. The official report of the 1956 Olympic Games mentions “the unexpectedly cold weather before the Games began” which was “squally for some weeks” with “frequent heavy rains throughout the winter.” We have seen that it rained in Melbourne in the days after the first Maralinga detonation. They accepted that “From general considerations, it would be apparent that radioactive deposition would occur on the mainland unless each test was conducted during an interval of interruption to the prevailing [emphasis added] wind circulation.” So the challenge was “the detection of breaks in the dominant wind patterns”. They report measurements from 30 monitoring stations using ‘gummed film’ – aka sticky paper – and comment “It is interesting to note that the large population centres, Adelaide, Melbourne, Perth and Sydney received no fallout at all.” Or at least “ if any activity was present, it was too small to measure” by the methods they deployed. The AWTSC insisted in 1957 that “In the case of the second  explosion.. the high level cloud from this explosion never crossed the Australian coast.” But 30 years later the Royal Commission had maps drawn from the data in the AWTSC paper which directly refute this claim. The AWTSC report that “After the first explosion both the primary and secondary clouds moved almost due east..” No mention is made of the 1.3 mm of rain recorded by the Australian Bureau of Meteorology that fell in Melbourne on September 28, as alluded to in the Argus articles including the press releases issued by the Minister of Supply on September 29. This was despite the fact that the AWTSC states “No rain was observed over the south-east areas of the continent throughout the whole of this period.” In fact, the Australian Bureau of Meteorology recorded rain in Melbourne peaking at 35.1 mm on October 19th – only paralleled through the whole of 1956 by a 34.0 mm rainfall recorded in January. 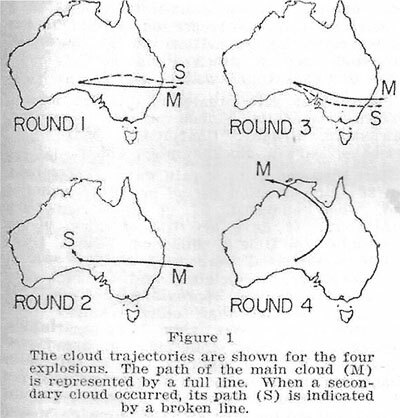 Similarly with the final shot fired shortly after midnight on October 22: “No rain fell in the areas over which the cloud moved.” BUT the cloud trajectories diagram for Round 4 in the 1958 AWTSC paper do not correspond with the data reported in the map drawn from the paper’s ‘sticky paper ‘data by the Royal Commission in 1985 labelled “The Distribution of Fallout over Australia from the Buffalo 4 test”. Several weeks before the second AWTSC paper was published in October 1958, Hedley Marston, a biochemist with the Division of Biochemistry and General Nutrition of the Commonwealth Scientific and Industrial Research Organisation in Adelaide, published his report on THE ACCUMULATION OF RADIOACTIVE IODINE IN THE THYROIDS OF GRAZING ANIMALS SUBSEQUENT TO ATOMIC WEAPON TESTS. Marston wrote that he “volunteered in October 1955 to undertake this investigation as a part of the Operation Buffalo Biological Programme that was conducted conjointly by the Agricultural Research Council and the Medical Research Council. The data reported in this paper were cleared for publication in November 1957.” The members of the AWTSC were closely involved in the ‘vetting’ of Marston’s paper in 1956, 1957 and 1958. 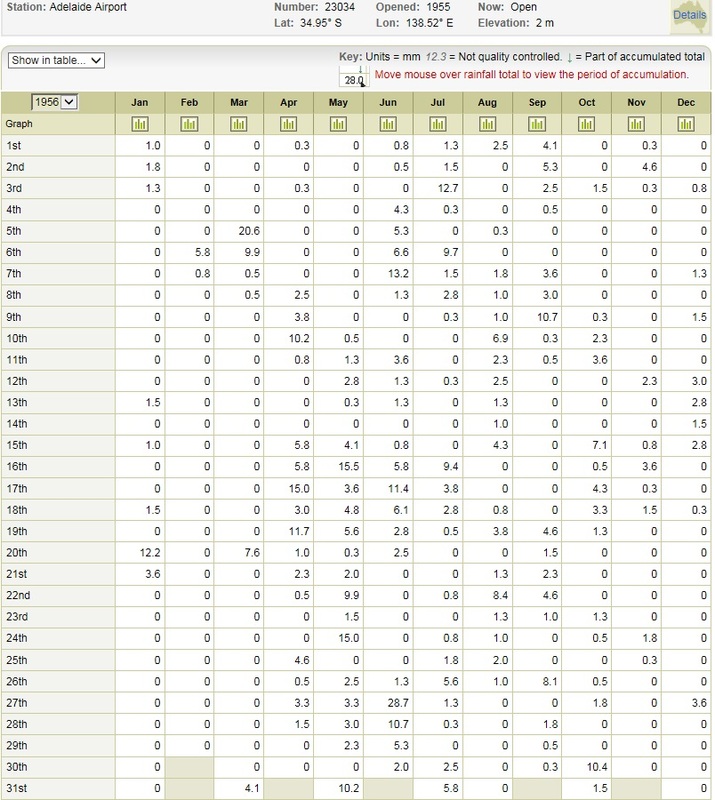 In fact, the Australian Bureau of Meteorology show 3.6mm rain fell in Adelaide on October 11. Be that as it may, Marston reported that, “The greater part of the precipitation [of fallout] occurred on two rainless days” in Adelaide. Both the 1957 and 1958 AWTSC papers stated that the radioiodine uptake by grazing animals reported by Marston would have no effect on the animals or the food chain. The Royal Commission concluded that the AWTSC “was very high-handed in its treatment of Marston.” The only newspaper that reported this study was Stock and Land. According to Roger Cross who has written a study of what came to be known as The Marston Controversy, not even the Adelaide Advertiser reported the finding that Adelaide had been contaminated at least once by atomic fallout from the Maralinga tests weeks before the Olympics started further east in Melbourne. Cross has suggested that a D-Notice was issued to the mainstream press but missed being served on Stock and Land. The cover-up has continued over the ensuing 60 years. The official historian wrote in 1987 – thirty years after publication of the thyroid paper, when the relationship between uptake of Iodine 131 and Strontium 90 accumulation in bones was well established – that Marston “drew erroneous inferences from his iodine-131 results, with no supporting experimental data.” But she also reported the awareness of the importance of Strontium 90 as a radiation hazard, which led to the formation of Operation Sunshine in October 1956 in which American, British and Canadian scientists agreed to test soil, milk, food and animal and human bones for evidence of strontium 90 accumulation. She reported “Penney quickly suggested to Martin, as chairman of the AWTSC, that Australian samples should also be collected”. Eventually the mounting evidence of the fallout of strontium 90 contributed significantly to the signing of the Partial Nuclear Test Ban Treaty in 1963. The Report of the Expert Committee on the Review of Data on Atmospheric Fallout Arising from British Nuclear Tests in Australia, released in May 1984, found the methodology of AIRAC9 (produced by the Australian Ionising Radiation Advisory Council in 1983) for calculating the collective dose-estimates for long-range fallout on the Australian population from the British atomic tests to be simplistic and “did not take into account additional plumes (and stem materials) arising from the variability in meteorological parameters with elevation above ground zero at the time of and immediately after, firing.” The Expert Committee “disagreed with AIRAC on many fundamental issues including interpretation of information on fallout levels, progress of radioactive clouds, dosage estimates, risks of exposure to certain groups and aspects of management and arrangements during the tests. Most of all it disagreed with the philosophy used to construct AIRAC 9 – the use of simplified assumptions which do not accurately reflect the complexities of what took and the constant endeavour to present the best possible case which results, to quote the Canberra Times, in a comfortable picture of the British nuclear tests.” But the Expert Committee also made no reference to the Olympic Games held a month after the last of the 1956 tests. The Committee did not explain why it felt freer to express its concerns only a year after the AIRAC 9 report, but “concluded that there was a need for a comprehensive public account of the consequences of the British nuclear tests on Australians and their environment.” This resulted in the Royal Commission. The Royal Commission stated clearly that “At the time of the test there was no general acceptance that small doses received by the population at large might increase the number of cancers in later years. A current evaluation of the likelihood of harmful effects of ionising radiation or contact with radioactive substances produced by the tests must be based on the hypothesis that any dose of radiation, no matter how small, is likely to increase the risk of harmful stochastic effects.” It concluded that “By reason of the detonation of the major trials and the deposition of fallout across Australia, it is probable that cancers which would not otherwise have occurred have been caused in the Australian population.” But “the Royal Commission has been unable to quantify the probable increase in the risk of cancer among the participants in the trial program or among the Australian population in general.” Nor, of course, they might have added but didn’t, in the participants and spectators at the 1956 Olympic Games in Melbourne a month after the first round of atomic weapons tests at Maralinga a thousand miles away as the wind blows. 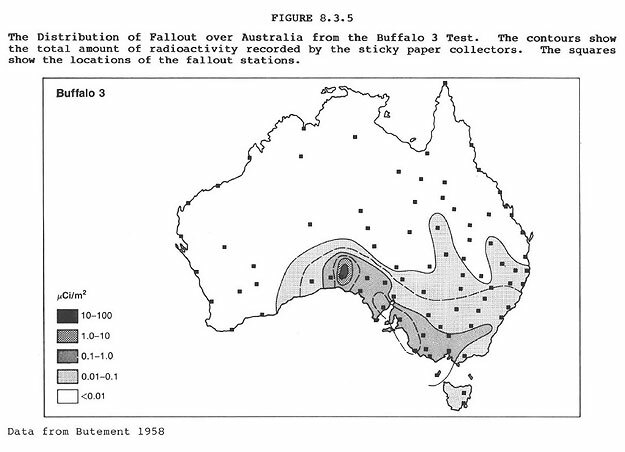 Meteorology was the responsibility of the Australians for the 1956 Buffalo tests. How could the most senior meteorologist in the country have acceded to atomic bomb tests in the weeks just before the 1956 Olympic Games from a ground zero plunk in the path of prevailing easterly air streams? What pressures were brought to bear? The Royal Commission concluded that “The AWTSC failed to carry out many of its tasks in a proper manner. At times it was deceitful and allowed unsafe firing to occur. It deviated from its charter by assuming responsibilities which properly belonged to the Australian Government.” It also noted that the English scientist member, Titterton, “played a political as well as a safety role in the testing program, especially in the minor trials. He was prepared to conceal information from the Australian Government and his fellow Committee members if he believed to do so would suit the interests of the United Kingdom Government and the testing program.” But not even the 1985 Royal Commission mentioned the continued testing up to a month before the 1956 Olympic Games. Meanwhile, Fukushima Prefecture is reported to be the venue for some events in the 2020 Olympics. Butement WAS et al. 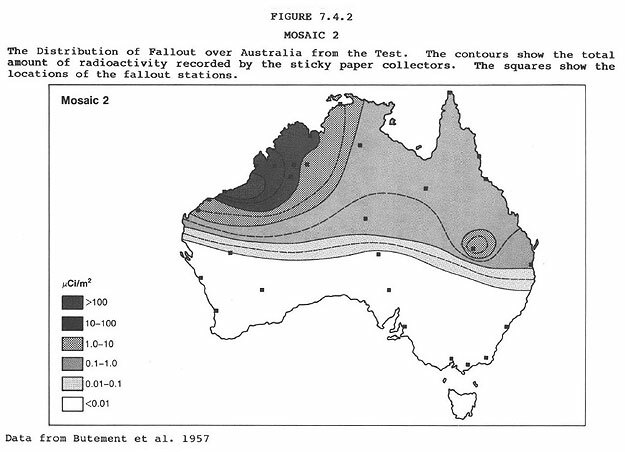 Radioactive Fallout in Australia from Operation Mosaic. Australian Journal of Science December 1957. Butement WAS et al. 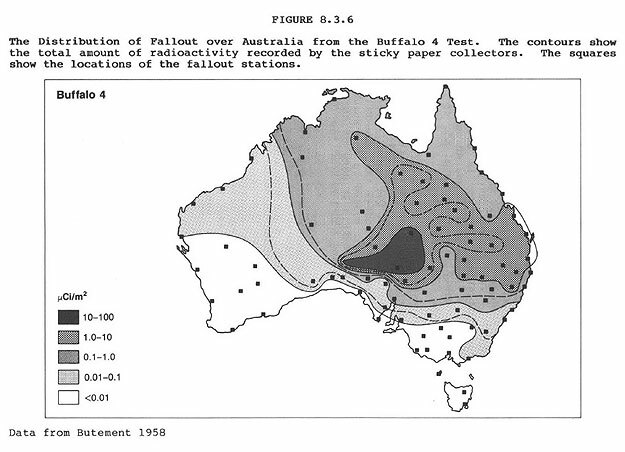 Radioactive Fallout in Australia from Operation Buffalo. Australian Journal of Science October 1958. Was Mark Oliphant Britain’s – and Australia’s – J Robert Oppenheimer?